True progress is made possible through healthy two-way communication between the academic team and the parents. 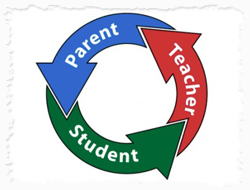 We acknowledge the role of parents in the process of learning and transformation and therefore involve them actively in all activities at school. Objective feedback about the child’s performance and personal strengths with practical tips on how progressive improvement can be brought in are given to parents periodically. Our interactive website enhances this interaction with everyday updates and options for transparent communication.